We build cutting boards, serving boards, and chopping blocks in all sizes and from all species of wood. One can be made for you to fit your needs. Here are a few that are in stock now. Come take a look. We can also ship anywhere. 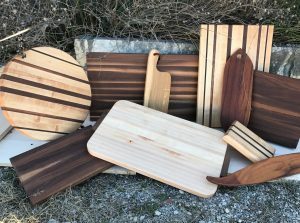 This entry was posted in Cutting Boards, Serving boards, Uncategorized and tagged chopping blocks, Cutting boards, kitchen, serving boards, wedding gift. Bookmark the permalink.